To understand what causes multiple sclerosis (MS) and how to heal from that, you must first understand what kind of disease it is. In the 1900s, the leading health concerns and cause of death were pneumonia, influenza, and tuberculosis. These are infectious diseases. Their solution? Antibiotics given in the form of an injection or pills. This solution was discovered in the early 1900’s, and it became very popular from the 1940’s onward. To the point that society hopes to treat every ailment in our bodies in this manner. Just give me a pill and make it go away!! But the main diseases our society struggles with today are far different. The primary health concerns today are heart disease, cancer, lung disease and stroke and a new group has become quite prevalent autoimmune diseases. What’s the difference? To begin with, they are not infectious. The main concerns of today, including MS, are chronic disease. 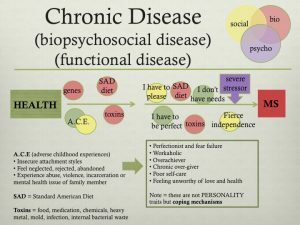 Technically, they can be referred to as biopsychosocial or functional diseases. These names begin to give you a clearer picture of both their cause as well as their treatment. sociological factors – such as relationships, support, family, community, gender age and ethnicity/race. They are diseases that take time to manifest and are already in your body before you ever experience the first symptoms. In the Creating Health Series, we will address all three factors in detail. Here we want to give you a general understanding of the causes of MS and how to heal. The last two, the psychosocial factors, are closely associated with MS onset and may play important roles in the development of the disease. There is much research that has studied these two factors. They are not caused by a personality trait of the person but by coping strategies learned in childhood such as the need to be perfect, highly controlling, overachiever or extremely independent. Fortunately, all of these life responses can be changed with understanding and support. So what are these coping strategies? These behaviors, beliefs, and lifestyles created through your life experiences that burden your body? You can find examples of the particular psychosocial patterns of MS here. These patterns are common to modern society. Interestingly enough, MS is most prevalent in 1st world countries and hardly present in less developed countries. Looking at these coping strategies, you can see that they share the values of modern society. The need to continually strive for perfection and being the best. Competitive environments. We must try to be wholly independent and self-reliant at all times. Additionally, modern society has created many of the biological factors that affect your health. Who and what defines your worth? What about failure do you fear? Is perfection the ultimate goal in life? How balanced is your work and play time? Define rest and relaxation. Who has defined your success? What would your definition be? What can you learn from interdependence versus independence? It is possible to heal from these factors, but it requires change. Changing your ability to respond to the challenges of being alive. You can find what the healthy psychosocial patterns look like here. Take small steps. Choose one area to focus on and make a specific plan. Plan for setbacks, practice acceptance, and problem solve. Set up a supportive environment and community. Don’t do this alone. There is support: Join the MS Self-Help Group in your area, get a nutrition practitioner to support the changes in your diet and to detox, and know that I can assist you personally using hypnotherapy and neurolinguistic programming (NLP) in working through the psychosocial factors that cause MS. Also the Creating Health Series has loads of information to help you on your journey. I think I might have multiple sclerosis, and I’m not sure what to do about it. It makes sense that I would want to see a doctor! This is definitely the kind of thing that you would want to know for sure if you have.